Chapter 6: "The Witch Queen’s Revenge"
Baba Yaga has been rescued from the clutches of her son Rasputin, but the Queen of Witches remains trapped inside a magical matryoshka doll. Delving into hidden chambers deep within the Dancing Hut, the heroes must open the nesting dolls imprisoning Baba Yaga, but they must also contend with the hut’s most dedicated guardians, including the former queens of Irrisen. When the time comes to finally face Queen Elvanna inside the Dancing Hut’s innermost sanctum, will the heroes defeat her and free Baba Yaga, or plunge Golarion into a new ice age? 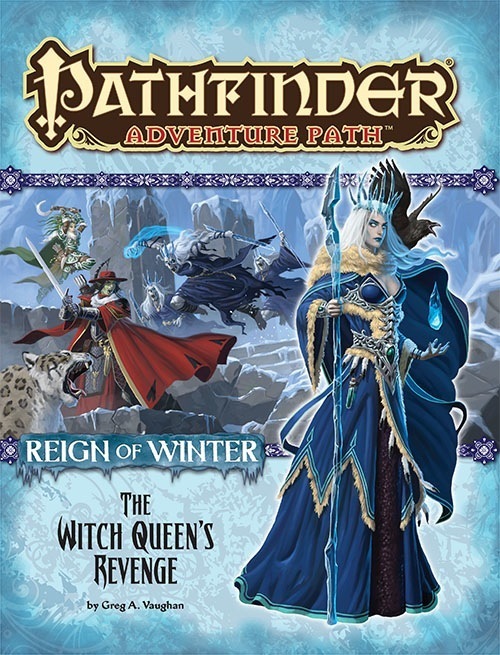 “The Witch Queen’s Revenge,” a Pathfinder RPG adventure for 15th-level characters, by Greg A. Vaughan. Ways for you to extend your campaign beyond the covers of this Adventure Path and carry on your adventures against the witches of Irrisen, by Adam Daigle and Rob McCreary. An exploration of the mysteries of Baba Yaga and her touch on the world of Golarion and beyond, by Adam Daigle. An escape from Whitethrone in the Pathfinder’s Journal, by Kevin Andrew Murphy. Four new monsters, by Shaun Hocking, Michael Kenway, Rob McCreary, and Matt Renton. 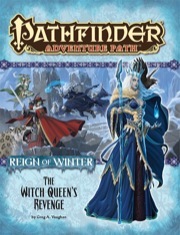 The Witch Queen's Revenge is sanctioned for use in Pathfinder Society Organized Play. The rules for running this Adventure Path and Chronicle sheet are available as a free download (639 KB zip/PDF). It's not a brightest part of the Reign of Winter(definetely Rasputin is), but still have good ending and great continuing plot. The Bad Queen is defeated by PCs, however, much more still remains to be done. The Real Big Bad Baba Yaga exist, so if PCs want to save the world, they eventurally showdown with her. I've reviewed this on RPGGeek.com. Good end to a great adventure path! The Witch Queen’s Revenge by Greg A. Vaughan brings to a close Reign of Winter, which has been a very ambitious adventure path. It has involved a few aspects that some people may not fully like mixed with their fantasy (a little bit of science fiction and some modern-ish technology), but it has done so in often brilliant ways. This final adventure has the unenviable task that all final adventure path volumes have: that of bringing all the loose ends together and tying them off in a satisfying manner, while simultaneously providing a fun and exciting adventure in its own right. For the most part, The Witch Queen’s Revenge manages this wonderfully. It’s an excellent adventure, albeit a touch railroaded, and its final resolution could potentially frustrate some players. There are a couple other issues as well, and as such, it’s not the best of the entire adventure path (that honour definitely goes to Rasputin Must Die! ), but it’s far from a weak adventure and it finishes off what has been a truly excellent adventure path overall. As the last adventure in what will be written in gaming history as one of the wildest, weirdest published campaigns ever, "The Witch Queen's Revenge" faces the challenging prospect of being worthy as a finisher. Well... it nearly is. The outline of the adventure - that is, the basic structure of the story - is really good. The PCs delve deep into the numerous pocket dimensions accessible through the dancing hut of Baba Yaga, collecting the keys to free the Witch Queen from her imprisonment. The nature of the keys is very unique, and should provide a nice backbone to the story of the adventure. However, unfortunately, the adventure quickly gets lost in a grind of fight after fight after fight after fight. There's really only a single NPC that's not meant to be fought in the adventure, and one part also allows the PCs to ally themselves with a tribe of locals, but that's about it. Every single other creature encountered simply attacks the PCs without provocation or sometimes even without much of a reason. What's worse is that the fights are sometimes very grindy themselves - like fighting 10 (!) CR 9 creatures at once - imagine how long that would take (that fight would have been better designed if the creatures were presented as a troop). Many other fights are very easy - like fighting a single CR 13 creature, for example. These fights are really nothing more than speed bumps in the way of a level 15 part of adventurers - are they just there to give the characters more XP? it's better to just hand it out as story awards. So sadly, the adventure mostly amounts to 6 separate, unrelated fetch quests that involve a TON of fighting and nearly nothing else. The themes of the locations are OK, but nothing mind blowing. While some of the fights are either grindy or speed bumps, some other fights look challenging and unique. All in all the adventure would have been pretty bad because of it's underlining design, except that paizo products are never actually BAD. so the adventure itself gets 3 stars, due to many neat little touches but an overall not very fun adventure. What pushes me to make a 4 star review are the articles - more specifically, the "continuing the campaign" article, which goes above and beyond previous articles of it's kind to really create an awesome mythic campaign for GMs to develop, one that fits the themes of 'Reign of Winter" very well. It sparks the imagination, and gives an insight to one of Golarion's numerous secrets (how the winter in Irrisen is maintained). This article is superb. As a bonus, Baba Yaga's stat block is nice, and gives us a peek at mythic rules. Announcing wintry goodness for July! Product image is a mockup, and will change prior to publication. Shouldn't it say 6 of 6? Was coming to this thread to post the same thing. Has it been revealed yet why we're helping Baba Yaga? Isn't she kinda evil? Maybe it has something to do with her being the only person who can stop the region-wide cold snap, or something. Also, her stat block is in this?! I'm curious what tricks the old crone has up her sleeve. Has it been revealed yet why we're helping Baba Yaga? Isn't she kinda evil? ...or will their failure plunge Golarion into a new ice age ruled by the Witch Queen of Irrisen? Even if Baba Yaga is an evil evil crone, being evil doesn't necessarily mean yearning for chaos and destruction (which would be the result of a sudden world-spanning ice age). At least not unless it's on her terms and not some upstart who thinks she can outmaneuver the Queen of Witches. I am really looking forward to this AP. Irrisen is my favorite themed land. Getting details on Baba Yaga and her history is a dream come through. Since Inner Sea Magic states that Elvanna is a Witch 20+, does that mean that her statblock will use Mythic rules, or she'll be just stated as a lvl 20 witch? Greg Vaughan is awesome. It looks like he has done almost one adventure path per series being the auther of #s 6,11,13,23,29,33,40,46,50,56,61, and now 72 (I could be off by one but don't think so). He is a very good author one of my favorites, he has also done quite a few PFS scenarios and adventures for dungoen and wizards of the coast. Note: This Adventure Path spends only about a sixth of its time actually in Irrisen—it's more accurate to call this the "Baba Yaga Adventure Path" than the "Irrisen Adventure Path." This message brought to you by the DoEM (Department of Expectation Management). Defenitly sounds like one of the more interesting APs. It is also cool that we get stats for Baba Yaga herslef. Also doesn't help that she has the backing of a entire nation (even if Irrisen isn't in this particular issue). Where do you get that notion from? I always thought of her motives as being too alien to be completely understood by the average inhabitant of Golarion. Looking at where some of the motives for this AP seem to come from (maiden, mother, crone --> greek goddess Hecate), this sheds a new light on Baba Yaga. Otherwise, it would be the theme of "the enemy of my enemy is my friend" which will put some presssure on all the do-gooders in your group. Elvanna's daughter, Princess Cassisoche, is listed as a Witch 8/Winter Witch 10. CR 21 sounds about right, it would put her right on par with Karzoug. What interests me more is the fact that we will be going up against all of the previous queens of Irrisen. This is interesting because the ninth queen, Tashanna, is heavily implied to be the very daughter of Baba Yaga that has earned some infamy in another campaign setting. A woman many may know under the name Natasha, Tasha (the creator of a funny spell), Louhi, "the mother of witches", and another probably more familiar name. Tashanna bound the demon lord Kostchtchie to her service when she tried to resist being deposed as queen of Irrisen. Perhaps an early version of her later work with demons and demon lords. She literally wrote the book on demons, and James Jacobs wrote some issues of an article with the same name back when Paizo published Dragon Magazine. So, yes, it would appear that Tashanna is none other than the witch of Greyhawk infamy, Iggwilv. It will be very interesting to see what happens with Tashanna in this issue. Perhaps James Jacobs could enlighten us on the issue, whether or not they are the same person. I've heard rumors that if you speak James Jacobs's name three times he will appear.... wait, oh dear! What have I done!? Bear in mind it doesn't say all former queens of Irrisen, so it's possible that there are only a few of them there and we might not get any further information regarding Tashanna. Elvanna? Not sure yet. She'll likely be above CR 20, but not necessarily thanks to mythic tiers. With Razor Coast and now this, Greg's a busy guy! Oh, didn't get that one yet, so I didn't know. That seems managable. On par with all other end bosses who party faces at lvl 17th. Where is that picture of the Gorynych coming from? I never seen that picture before? I really hope Gorynych is in the previous AP about the Russian humans, then at least there will be cool russian monsters in the previous AP. I can't wait for the Baba Yaga stats! Will the mythic rules be published by then? The final version will have been written and sent to the printer, so Paizo will have access to the finished version. The Mythic rules themselves, will release the following month. That is not a Gorynych, it is a Khala, that picture is from Irrisen land of eternal winter campaign setting book, page 50. Not sure how this is viewed but should it really say that Rasputin is the son of Baba Yaga? That seems like a big spoiler to me. But then again, I was planning to play a male winter witch PC related to one of the lines in the running for the next queen of Irresen. I would have liked the surpise to find out Rasputen's true origins. Well, if you're character's from Golarion, he'd never have heard of Rasputin anyway so the surprise isn't much of a surprise. Some guy in another world you've never heard of is Baba Yaga's son. Okay. Rasputin only gets interesting when viewed from the perspective of future history. At the time he was around, he was just a subject of political gossip like when Nancy Reagan was getting advice from her personal astrologer. Where do you get that notion from? I always thought of her motives as being too alien to be completely understood by the average inhabitant of Golarion. According to Inner Sea Magic, she's NE. Further, while she may have obscure motives, concurring and enslaving a nation and paving its roads with the bones of its former citizens is evil no matter how you look at it. Surely you can see behind her guise as evil crone and perceive her benevolent nature of the typical fairy tale gran'ma. It really depends on what route Paizo takes with her. Depending on your interpretation of the folklore, she could be anything from a straight-up murderous boogeyman to a stern guardian spirit. Based on what I know about the PF version, I'd say she falls somewhere in between. Evil in an amoral manner, incomprehensible to most, dangerous but also potentially helpful, and not giving a crap about what others think of her actions. Also, according to Inner Sea Magic, Irrovetti is CN, but when you actually encounter him in Kingmaker he is CE. Granted, the odds of an immortal, already millennial-aged being going through an alignment change in just a few years are slight, but the odds of such a being who is only encountered once a century & who on that occasion has to ride herd on a NE nation, overseeing a transfer of power at the highest levels, being viewed one way, when if fact she is something else. That chance is actually pretty high. Hell, we don't even know that Elvanna started out evil. One hundred years, stuck in a job where you are surrounded by enemies on all sides, any action that might be perceived as weakness a danger to you, those you care about & the nation you are charged with. People crack. ...the odds of such a being who is only encountered once a century & who on that occasion has to ride herd on a NE nation, overseeing a transfer of power at the highest levels, being viewed one way, when if fact she is something else. That chance is actually pretty high. When a character has their alignment listed, that isn't a matter of how s/he is viewed by others. A NE witch queen is NE no matter what others think. However, established PF characters do occasionally have their alignments changed when it makes sense for the story. Irovetti as you mentioned, as well as the BBEG of Skull and Shackles. I seriously doubt her Familiar is going to be a cat however. Unless it is one of those ones that only look small & cute, but are actually six different kinds of hell-on-wheels in a fight. That's the cold sister picture from the Irrisen book. *Cold weather Kyra is still the coolest of the bunch! Updated cover art should be rolling in any day now. Maybe? Can't wait for this one! I hope June goes by fast. Updated with final cover image and product description. Whoohoo! And I saw it before Cheapy! EDIT: Actually is a really cool cover!